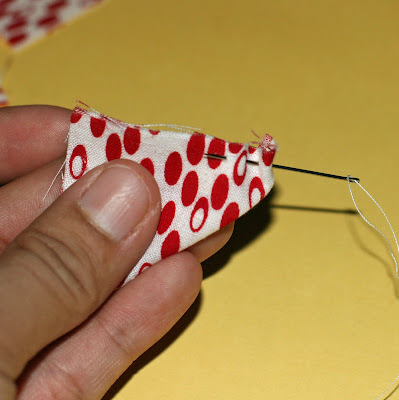 Gather up your supplies--you will need scraps of fabric, needle, thread, scissors and your choice for a center. Look to your stash--I have a tote full of 2x2 squares which will create a 2 1/2" flower, use larger squares for larger flowers. 3. Take your needle and thread it long enough to be able to sew through all triangles. Start on the right side of the triangle with the point at the top and continue to the other raw side of the triangle. Pull tight and you will create the petal. With the same needle and thread continue with the other triangles. When you have sewn all the petals sides and pulled to form the petal, you will need to sew petals 1 and 5 together. Take a couple of extra stitches to secure.